Christine Blasey Ford and the Gendered Expression "It's Fine"
During the first part of Dr. Christine Blasey Ford’s gutting testimony, she was asked about the circumstances surrounding the polygraph test she took prior to testifying. Her response was tearful but restrained; she choked her emotions back in an attempt to make the proceedings easier for everyone around her. “I endured it,” she told Rachel Mitchell, the prosecutor tasked with leading the inquisition, of the polygraph test she took on the same day she attended her grandmother’s funeral. “It was fine,” she added. Nothing about Ford’s grueling three-hour inquisition, as Mitchell questioned Ford’s credibility with the demeanor of a judgmental Sunday school mother, was fine. It was not fine that Ford and her family were driven from their home after she came forward. It was not fine that Ford had to take a polygraph test to establish her credibility. Nothing about any of it was fine. But fine is what it has to be because she is a woman, and even in a moment that was deeply painful and difficult, her duty at that moment was to be conciliatory: to read the room, take its temperature, and adjust accordingly. But it was fine to watch Brett Kavanaugh yell at and interrupt Senator Amy Klobuchar in a hearing about whether or not he should be confirmed to the Supreme Court. “It was fine,” is what to say when you walk into a room of men and feel the chill in the pregnant silence created by your arrival, understanding that they have been talking about you before you entered their space. It has to be fine because if it’s not, then women are forced to demand a man’s time to determine why—burdening them with our messy emotions. Saying that something is fine when it is decidedly not is the easiest way to move a conversation along; it forces closure even as a situation begs for excavation. It’s a joke. “I’m fine,” a woman will say, even as the world around is crumbling. Injustice is like muscle memory; for women, it’s like breathing. Dr. Ford’s performance of fine is a direct result of that imbalance, a skill honed to soothe and comfort. In contrast to Ford’s measured calm, Kavanaugh shouted into the mic like a petulant child. For him, nothing was fine and his aggrieved tone throughout the proceedings made that abundantly clear. He was not interested in containing his feelings or making those around him comfortable—he was not expected to. Establishing the equilibrium is a woman’s job; anger is reserved for men. An angry man is strong, but an angry woman is defective, weak, and easily dismissed by men. Kavanaugh’s rage was fluorescent. But Ford, who spent part of the testimony patiently clarifying how memory works to Senator Dianne Feinstein, was likely just as angry. But because her anger would have rendered her testimony suspicious; in its stead, she dug deep and insisted that she was fine. Ford’s behavior in the room on Thursday could be read as a woman’s desire to accommodate, as Jennifer Senior did in the New York Times. 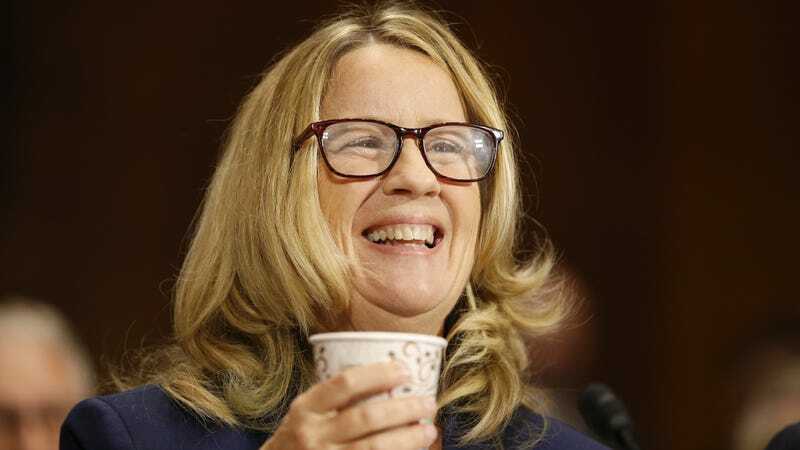 “There was an unbearable poignancy to Blasey’s nervousness, an implicit apology in her performance,” Senior wrote, “one that combined a deep wish to be taken seriously with a sincere desire to get things right.” But characterizing Ford’s behavior as apologetic in an attempt to be taken seriously feels like a slight misreading of Ford’s intentions. Her desire to get things right speaks not only to her desire to be taken seriously, but also to her personal integrity. Throughout her testimony, she constantly checked to see that what she was doing was right, in an attempt to ensure the many watching that everything was going to be fine. Fine is a subtle acknowledgment of imbalance and of injustice. It smooths over rough edges and creates comfort. That demand is uniquely gendered. Women are expected to make things comfortable, processing their trauma by making it palatable for a group of powerful white men who so easily brush off claims of sexual assault. When something is fine, it’s clear (to other women, at least) there’s something amiss. Fine is a smokescreen. Fine is gendered speech; fine is never the absolute truth. It is never fine.